Hey, forex buddies! 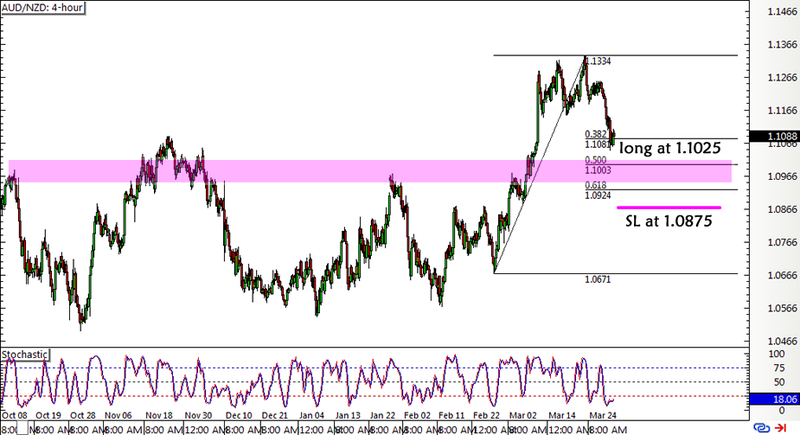 I’m putting my orders in for this long AUD/NZD setup I’ve been watching for quite some time. I had to adjust my Fibs a bit since price popped up slightly higher last week but the pullback opportunity is already starting to materialize. As I’ve mentioned in my previous update, I’ve decided to wait for a retracement to the area of interest at the 1.1000 major psychological mark, which coincides with the 50% Fib. I’m planning to aim past the previous highs, though, since I based this long trade idea on the inverse head and shoulders pattern visible on the pair’s daily chart. As for my stop loss, I’m setting it below the lowest Fib and the 1.0900 major psychological mark, which might be the line in the sand for an uptrend pullback. I’ll be trailing this stop once price tests the previous highs just past the 1.1300 mark. Overall, I’m still bullish on this pair mainly because of the RBA’s reluctance to lower interest rates further. In contrast, the RBNZ recently cut interest rates by 0.25% and seems open to more easing moves should their economy continue to weaken. Earlier today, Australia reported a stronger than expected 0.6% gain in private sector credit, outpacing the previous 0.5% uptick and signaling stronger confidence among businesses and consumers. As for New Zealand, its NZ business confidence index slumped from 7.1 to 3.2 to indicate weaker optimism. Moving forward, I gotta keep close tabs on this forex setup during the release of China’s PMI readings on Friday, as these figures could have a strong impact on AUD pairs and market sentiment. Both the official and Caixin versions of the manufacturing PMI are expected to show small gains, which might be enough to give the Aussie a boost then. What do you guys think of this forex setup of mine? As always, I’d love to get your feedback on my ideas!